NAPP is a nonprofit organization dedicated to supporting patent practitioners and those working in the field of patent law in matters relating to patent prosecution and its practice. 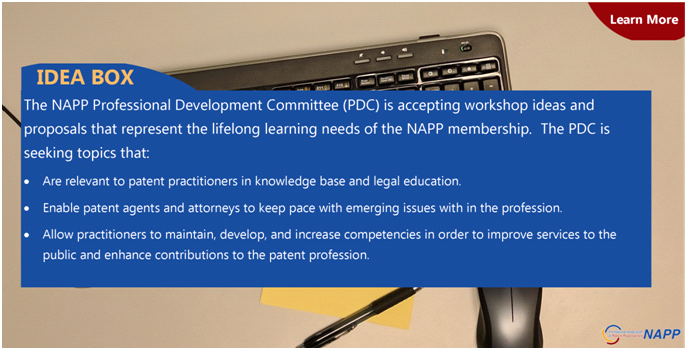 The NAPP Mission is to provide networking, education, collegial exchange, benefits, and a collective voice in the larger IP community on patent law and prosecution practice, so that patent practitioners can flourish and achieve the highest levels of competence and professionalism in their practice. Each NAPP member gets value in his or her own way. We invite you to explore our website so you can see the value membership holds for you. Reach out to NAPP at [email protected] with any questions. Purchase NAPP 2018 speaker videos here. More information about the NAPP 2019 AMC here.